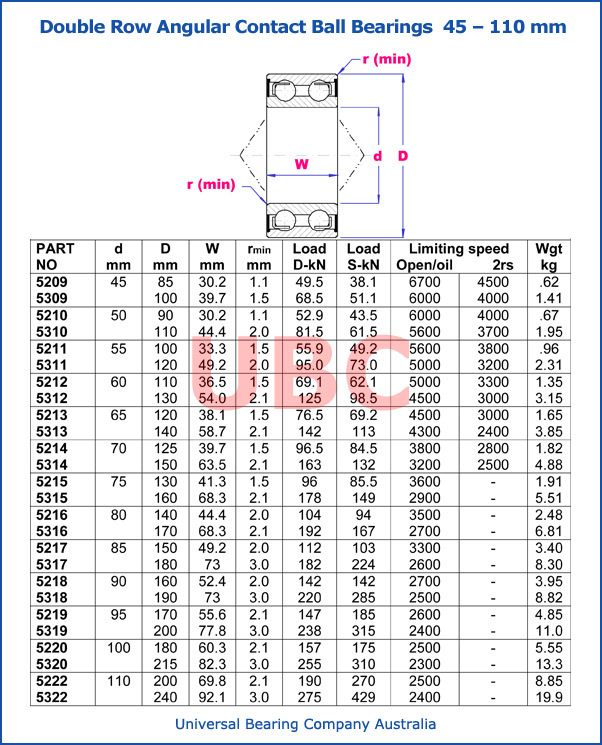 Double row angular contact ball bearings 45 – 110 mm UBC Universal Bearing Company The design of double row angular contact bearing is similar to two single row angular contact ball bearings placed adjacent. The design is non separable type. The basic design does not have filling slots and can accommodate equal axial loads in both directions. The ones with a larger outer diameter have filling slots in one direction and have a pressed steel or machined brass cage. Bearings with E design have high load carrying capacity. They also have filling slots on one side and that allows incorporating large number of balls. Double row angular contact ball bearing are also available with shields (non-rubbing type) and seals (low friction and rubbing type) on both sides. They are filled with lithium based grease that inhibits rust and can operate from temperatures -30C to 110C. Double row angular contact ball bearings catalog.